Scissor Lift Certification Saskatoon - Scissor lift platforms are utilized at work places in order to enable tradespeople - like for example iron workers, welders and masons - to reach their work. Making use of a scissor lift platform is typically secondary to their trade. Therefore, it is important that all operators of these platforms be well trained and certified. 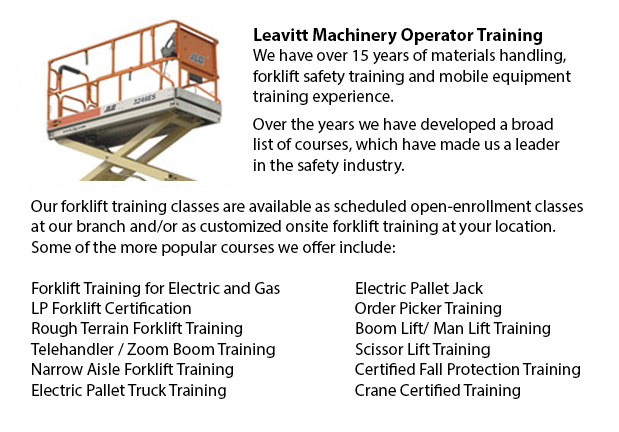 Industry, lift manufacturers and regulators work together to ensure that operators are trained in the safe use of work platforms. To protect individuals working around work platforms from accidental discharge of power due to close working proximities to wires and power lines, there is a minimum safe approach distance (MSAD). Voltage could arc across the air and cause injury to workers on a work platform if MSAD is not observed. To guarantee maximum stability, caution should be taken when the work platform is lowered. Moving the load towards the turntable, the boom should be retracted. This would help maintain stability when the -platform is lowered. The rules regarding tie offs do not mandate people working on a scissor lift to tie themselves off. Several organizations will on the other hand, require their personnel to tie off in their employer guidelines, job-specific risk assessments or local regulations. The anchorage provided by the manufacturer is the only safe anchorage wherein lanyard and harness combinations must be connected. It is important to observe and not go over the maximum slope rating. The grade can be measured by laying a board on the slope or by laying a straight edge. A carpenter's level could then be placed on the straight edge and raised until the end is level. By measuring the distance to the ground and dividing the rise by the length of the straight edge, then multiplying by 100, the per cent slope can be determined. A standard walk-around check must be carried out to determine if the unit is mechanically safe. A location assessment determines if the work place is safe. This is important particularly on changing construction sites due to the possibility of obstacles, unimproved surfaces, and contact with power lines. A function test must be carried out. If the unit is operated correctly and safely and right shutdown measures are followed, the chances of accidents are greatly reduced.